Back in the early 1950’s when Knight’s Flowers started in business in Lake City, just about the only rose color your true love got for Valentine’s was red. A florist might have a few white or pink roses back then, but 60 years later we have kaleidoscope of colors. At Knight’s we carry over ten different rose colors. Now there are over 120 different rose varieties to chose from, many which last over 10 days! The new reds for roses range from shades of bright raspberry to majestic scarlet to velvety-dark red to orange-kissed hues. At Knight’s we use the heart stopping Corazon rose from Rio Roses, which is a bright red rose that opens fully, last for over 2 weeks and amazingly doesn’t droop. 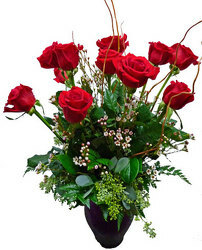 Check our our ‘Dozen Red Roses’ arrangement that is sure to impress your love one. This year we have traditional bridal pinks or adopted siblings of hip hot pinks. Cousins on this family tree include peaches, apricots, corals and lavenders. 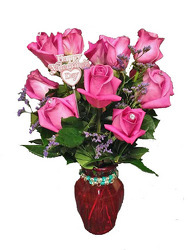 Check out our ‘Valentine’s Jewels’ bouquet for a wide variety of pink color tones this Valentines. Whether crisp lemon, buttery hues, golden yellows or trendy two-tones, the variety of yellow roses cover a broad spectrum of color – and appeal. If you’ve never given flowers to a man before, introduce him to this family of colors. Yellow is the second most popular color cited by men. This year at Knight’s we have a wicked yellow rose that has red tinted edges on its petals called ‘Circus’. 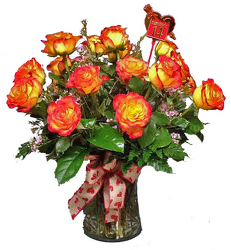 Check our ‘2 Dozen Circus’ roses arrangement that sure to brighten up any lovers day. 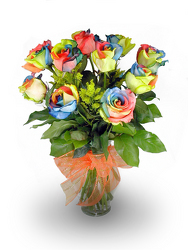 One of the hottest new trends in Valentines colors that past couple of years is a rose color called ‘rainbow roses’. Each petal on this rose is dyed a different color to create a spectacular show. If you want to just blow away you sweetie pie this valentines order this rose arrangement we call “Groovy Lovin’ Roses”. Roses are like fine wines, a delight to be savored and cultivated. Like an expanding wine cellar, Knight’s Flowers coolers are now stocked with more choices worth learning about. After all, variety is the spice of life.